Make your own deli salad delight. Great for Independence Day and you can hold the toast if you like for picnics and barbecues. In a large bowl, combine vinaigrette, marmalade, and mayonnaise; set aside 2 tablespoons. Stir chicken, blueberries, red pepper, and scallions into remaining dressing in the bowl. Add salt and pepper to taste. 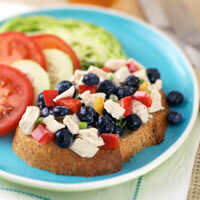 Place one slice toast on each of 4 dinner plates; divide salad onto toast. Arrange lettuce and tomatoes beside sandwich and drizzle with reserved dressing.